As an example, KLN 80-180E is a 5KW model with Rated Voltage = 80V, Rated Current = 180A with LAN (LXI) interface. 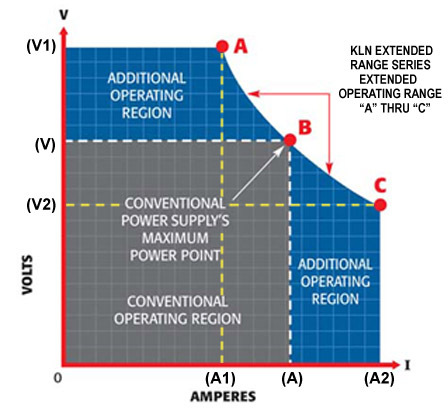 The constant power technique used by the KLN Extended Range Series allows a single power supply to meet the three requirements noted above for V x A, V1 x A1 and V2 x A2, plus all points within the area beneath the arc formed by "A", "B" and "C". This is possible because the maximum voltage and current are not fixed, but are limited by the maximum power of the KLN Extended Range power supply.